Academy manager Tommy Parkinson said on his after match interview that he didn’t know what to expect as his side played their first game against Ebbsfleet’s academy. But what he saw delighted him as his talented youngsters took apart a far more established set-up. In the opening stages it took a while for the Angels’ lads to find their rhythm and Ebbsfleet dominated including an effort that hit a post and another that forced Angels goalkeeper, Joe Roberts into a save low to his right. Tonbridge’s first attempt came on 13 minutes when Jacob Lambert brought a good save out of the visiting goalkeeper. Ebbsfleet continued to dominate so it was against the run of play that the Angels went ahead after 23 minutes when Josh Stirman was brought down in the box. The Angels skipper dusted himself down to send the goalkeeper the wrong way from the spot. Josh admitted after the game that he hadn’t taken a penalty for about two years and didn’t particularly enjoy the experience! The goal bred confidence into the Tonbridge side and they were good value when they doubled their advantage after 34 minutes. A cross from the right was spilt by the goalkeeper under pressure from the Harrison Mayhew leaving Lambert with a tap in. 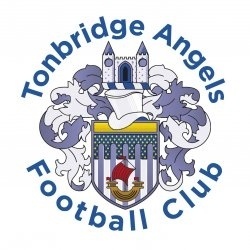 Tonbridge went into the break three goals to the good when a ball pumped forward was head on by Tom Hylton into the path of Stirman who ran on to finish clinically. There remained time for Roberts to excel denying an Ebbsfleet effort with a fine save at his near post. Tonbridge showed no signs of taking their foot off the pedal as they added a fourth early into the second period when Sam Babayele hooked the ball into the far corner after being set up by Stirman. Ebbsfleet worked hard to salvage some consolation and thought they had one when their centre lobbed Roberts but were denied by a fantastic saving clearance from the line by Harry Hudson. However, the Angels were denied their clean sheet when the visitors scored with a shot into the bottom corner with five minutes remaining. Tommy Parkinson paid testament to his player’s work ethic and attitude not only during this match but also in training since their induction into the Academy. On this performance, individually and collectively, the future is bright for this talented team.